Description: CP 5958, with mismatching number boards, leads SOO 6030 and CP 5995 on train 652 past the LaCrosse Amtrak depot. Description: Just out of reach for the New Brighton Album, CP 5958 has plenty of ponies assisting with the Dresser Turn this afternoon. Title: 39Z on a foggy and rainy morning. Description: Nice CP lashup heads West through Phillipsburg in the early morning rain and drizzle. Description: CP 38T running lite power for Oak Island, NJ @1529h. with St.L&H scheme on the point. 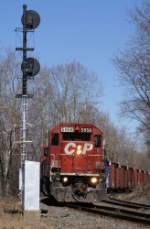 Title: CP 5958, CP's Tomah Sub. Description: Sitting in front of the round house. Title: CP 5958 CP's River Sub. Description: ICE Train 170 St.Paul To Kansas City. Temp is 15 Degree's. Description: ICE Train 170. Note Differant Number Boards. Description: The FRA geometry train is parked on a spur for the weekend. Description: A FRA Tech Train sits in La Crosse waiting for its next assignment! Description: #280 climbs West Salem hill. Description: Taking the West Runner during the last few minutes of available light. Description: 291 rumbles passed the former leg of the wye at Camden right as the sun sets.